If your surgery is more involved a general anesthesia may be used. By definition, general anesthesia is a controlled state of depressed unconsciousness with the absence of pain sensation, and with muscle relaxation. Patients undergoing general anesthesia do not breath on their own, as they are unable to maintain an open airway. Their airway then is maintained for them and they are under constant surveillance with the anesthesiologist. This type of anesthesia is maintained by inhaling a gas or inhalant anesthetic in combination with other medications such as opioids. 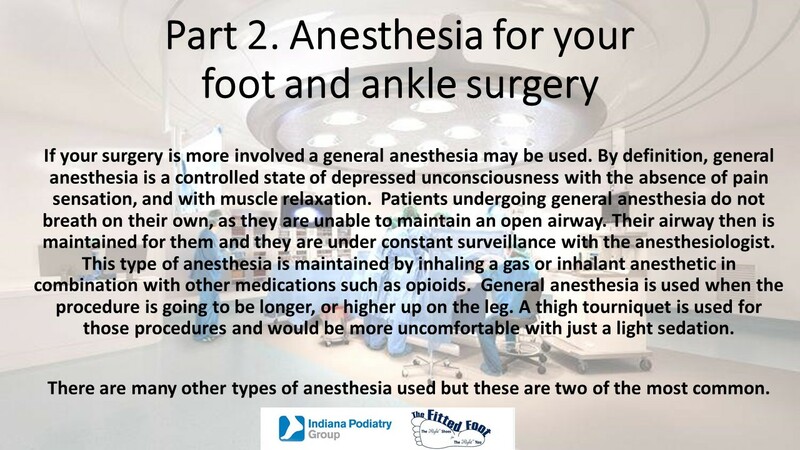 General anesthesia is used when the procedure is going to be longer, or higher up on the leg. A thigh tourniquet is used for those procedures and would be more uncomfortable with just a light sedation. There are many other types of anesthesia used but these are two of the most common.